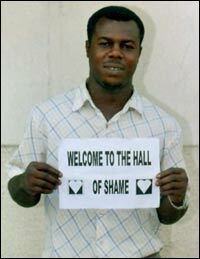 Welcome to the Hall of Shame! As any veteran Scambaiter will tell you, our arch enemies the scammers, love to try out their photo editing skills in the vain hope of fooling us into thinking the "photographic identity" they have sent us is really them. As scambaiters, we try to convince the scammers to send trophy pictures, such as the ones in the Trophy Room. Some scammers think they are clever enough to fool us by sending faked images. Every now and then they send out fake pictures so incredibly bad that they are minor masterpieces! Quite often we receive fakes so horribly put together that it would be hard to imagine that they can get any worse, however we are invariably made to rethink the abilities of these master forgers! We are constantly amazed that scammers expect us to be fooled by these efforts. It should be noted as in the Trophy Room, that most of the names given to us by the scammers are false. For instance you will see names such as Charles Taylor, Mariam Abacha or Joseph Estrada being used quite a lot. Names are to be taken with a pinch of salt as scammers love to take on the identity of important government officials or heads of state. Some of the images below may be so badly put together that you may feel the urge to laugh uncontrollably. 419eater.com takes no responsibility for any laundry bills that may be incurred by viewing the following pictures!